Go on a color tour of your town: spend an entire day out and about, observing the uses and expressions of color everywhere EXCEPT at a museum or gallery. You might begin with the most obvious uses of color, like the red/green/yellow of traffic lights, but soon you will undoubtedly start to notice more and more about uses, expressions, and meanings of color. Bring a notebook, and make notes about how colors are used symbolically or harmonically, as shapes, as warnings, as advertisements, as celebrations, or as expressions of personal taste. What colors do you like? How are people adorning themselves with color? What kinds of colorful objects are there in the world? What is the meaning of a man in a pink jacket or a woman in a loud orange uniform? How are colors used, or not used, in architecture and on exterior walls, on billboards, on products, at grocery stores, on TV monitors, at recreational areas or municipal buildings, at police departments or at beauty parlors, and finally, in art at a museum? What kinds of limitations or expectations do we have about colors? Where do we censor color? Try to focus ONLY on color—nothing else—first out in the world, and THEN at a museum to study how color works in art. After making a thorough study of color, invent some interventions that can be done with color alone. For example, wear or use some color on your own body for a day in a manner that is unexpected and out of the ordinary. Or, make a colored object or flag and put it in a public place where it signals a mysterious color message of your own invention, and see what happens. 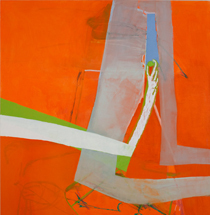 Amy Sillman is an artist whose painting practice emphasizes the rigorous negotiation between the physical and material properties of painting and its formal, psychological, and conceptual dimensions. Through bold gestures, dabs, drizzles, and thick applications of paint, she constructs her work in an intensely physical way. Whether creating formally rigorous oil paintings or black-ink figure drawings of close friends, Sillman’s work explores larger issues of feminism, performativity, and humor. Before becoming an artist, Sillman held various jobs. 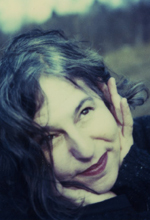 She worked in a cannery in Alaska, a silkscreen factory in Chicago, and studied Japanese language and literature for a year at New York University. Finally her studies led her to painting at the School of Visual Arts in New York City. After graduating, she spent the next decade creating, experimenting, and simply learning how to paint. 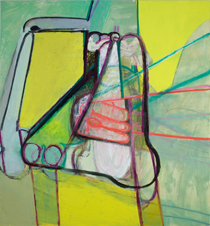 Nose, Amy Sillman, 2010. Oil on canvas, 84 x 90 in. Blue Diagram, Amy Sillman, 2009. Oil on canvas, 90 x 84 in.